We have a huge range of galvanised commercial shackles in a range of different sizes and styles. These are perfect for use with static caravans and act as connectors. Available as bow shackles, D/Dee shackles and dee shackles with countersunk pin. Our extensive range are available singularly or in multipacks of up to 50 shackles and are brilliant for use not only in the caravanning industry but also for other numerous applications. Their versatility makes them the perfect accessory for your caravan and for your tool kit. Whether you’re looking for your first galvanised commercial shackle or you’re a returning customer, we have everything you need in our range. We understand the importance of resilience when it comes to purchasing static caravan accessories and so we ensure all of our products are able to withstand even the harshest of weather conditions. Our commercial shackles are galvanised which means that they are resilient against rust. 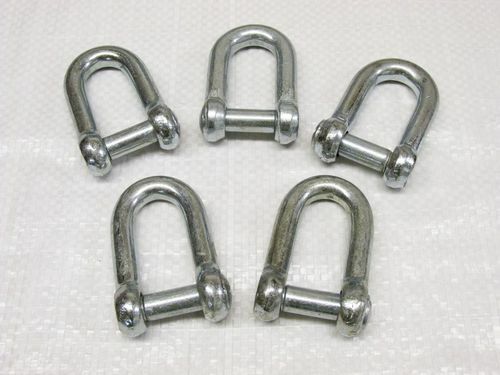 In addition to being galvanised, they are also zinc plated to give them ultimate protection, so you can be sure that your commercial shackles will always hold firm, guaranteeing your caravan’s safety and security. Why Choose SecureFix Direct For Your Commercial Shackles? Here at SecureFix Direct, we guarantee to provide the highest quality products at some of the best prices on the market. No matter what size or style you’re looking for when it comes to galvanised commercial shackles, we can be sure to have exactly what you need. We have a huge range of sizes with all of our bow shackles, d/dee shackles and countersunk pin shackles. This means that you have a huge range to choose from, in order to suit all of your applications. We offer a free express delivery and fast despatch service with our whole range of products across the site, and if we receive your order before 12pm, we can even get your product despatched the same day. This means that you can get the best products as quickly as possible. If you have any questions regarding any of our products, or have any other general enquiries, don’t hesitate to get in touch with a member of our friendly team today.